Rain can make Dubai's skyline even more spectacular – especially if the cloud is low. Hunker down in a rooftop restaurant and watch the rain clouds roll in, skirting the peaks of the skyscrapers and turning the sea a moody shade of indigo. You'll find the best views at At.mosphere, a bar on the 122nd floor of the Burj Khalifa, and at The Observatory, a bar/restaurant on the 52nd floor of Dubai Marriott Hotel. The cocktails are so nice that you won’t want to move, even if the weather clears. It might be raining outside, but it's snowing indoors... at Ski Dubai. Yes, it's a bit gimmicky, but there's something pleasingly bonkers about carving up a snowy ski slope while you're in the middle of the desert. 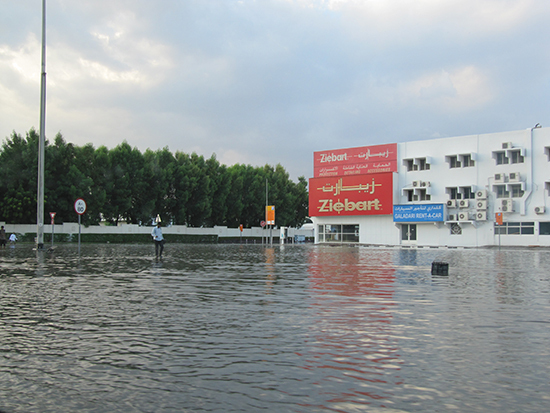 Of course, this being Dubai, the slope is inside a whopping shopping mall (Mall of the Emirates), so if the rain hasn't cleared by the time you've hung up your skis you can indulge in the locals' favourite past time: shopping. 'Brunching' is another bonafide hobby in Dubai – but this is no leisurely breakfast. This is a four-hour mega-feast of incredible cuisine, live music, and free-flowing booze. A good brunch is pricey (anything from £50 to £150 per person), but this is bigger and better than any buffet you've ever encountered before. They're mostly on Friday afternoons, from 12 to 4pm. Not sure which brunch to choose? You need this guide to Dubai's best brunches. And if it's still raining after 4pm, fear not. Most hotels host happy 'hours' that last long into the night – although you'll find me curled up, nursing my bloated brunch belly and cursing that extra lobster dim sum. If it's drizzly outside, bask in the glow of Dubai's Gold Souk, a traditional-style marketplace that's positively brimming with bling. 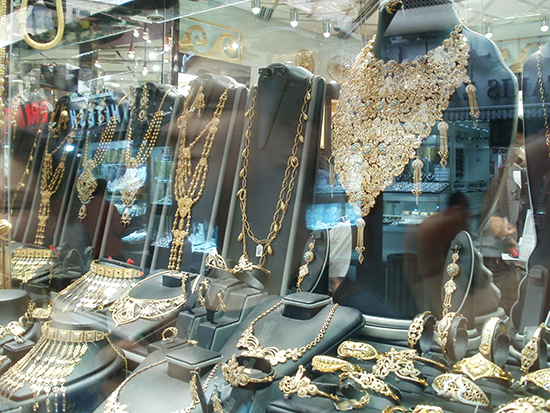 Here you can haggle for everything from necklaces and tiaras to tiger statues and ingots – and trust me, you'll need to dust off your bargaining skills. Research the price (per weight) of gold beforehand, and be prepared to drink lots of mint tea or spiced coffee while you're haggling – it can be a lengthy process, but it'll be a rainy afternoon to remember. 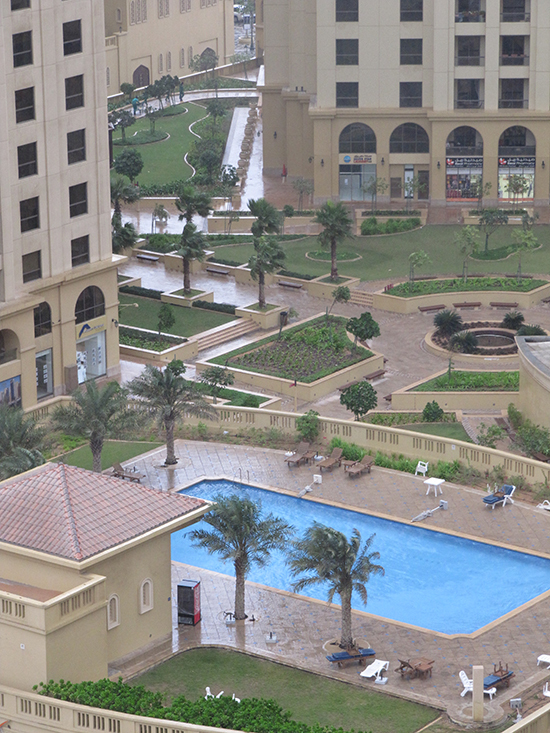 There’s something rather romantic about a swim when it’s raining – and even when the clouds roll in, Dubai never really gets cold. Don’t let your bikini languish in your suitcase: hit the beach or your hotel pool for an atmospheric dip, and chances are you’ll have it all to yourself. Result. Only in this ridiculous city will you find a spa treatment that simulates rain. But oh my, it is quite divine. You’ll stand under a misty, delicate shower of warm raindrops, sometimes even with rainforest sounds – very Jungle Book. So Spa (at Sofitel the Palm Dubai) is highly recommended for its ‘Under the Rain Experience’, which includes a eucalyptus steam room and massage too. Fancy something a little more authentic? 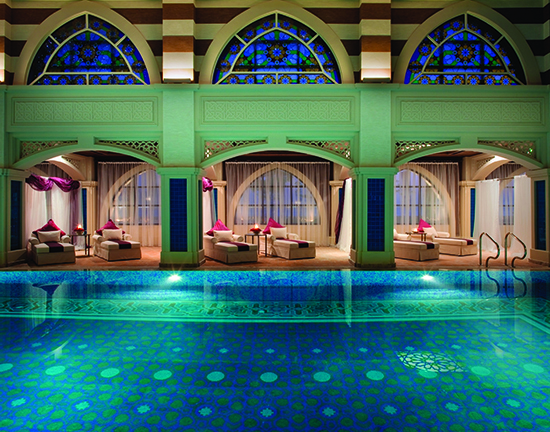 Try a hammam treatment at Jumeirah Zabeel Saray – you’ll be scrubbed, soaked and massaged in true Middle Eastern style, with plenty of time to wallow in the ornate steam room.